Leadership assessments and talent retention in M&A--the decisions regarding who goes, who stays, and who is in charge--help determine the future direction of the business and the workforce’s views on what the new organization values. Unfortunately, selecting someone to stay does not mean they will. 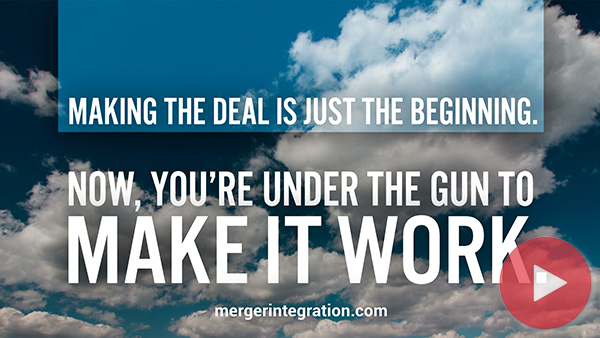 It is not surprising that people often choose to leave an organization or “de-commit” during a merger or acquisition. Acquirers should re-recruit the crucial people in the target company before competitors capture their attention. Merging becomes even more risky and problematic without the help of a target company's best performers. If the acquired workforce is to be integrated—truly merged—then the staging for this consolidation should begin well before the deal is formally closed. Problems develop rapidly when the parent firm fails to orchestrate a prompt and systematic assimilation process. Organizations routinely suffer a loss of identity upon being acquired and with that loss comes an erosion of employee commitment. Motivation deteriorates as people’s sense of “my company” fades and blurs, making it harder for them to maintain an emotional attachment to the organization. Also, personal ties to upper-level managers or the owner may be severed as those people leave the scene, eliminating important personal loyalties that previously generated strong motivational forces. The widespread turmoil created by change turns people’s thoughts inward, away from their job and toward personal concerns. Self-protective thoughts swirl through their minds, leaving people to wonder about the wisdom in waiting to see what will happen to their careers. Effective staffing plans and onboarding processes quickly reduce uncertainty and re-focus people back on the business. In this section, our articles explain how to evaluate the acquired company's management, design a new organization structure, retain key talent, manage redundancies, and onboard new employees. We also provide slides from our Merger Integration Certification Workshop that reveal guidelines on how to identify and retain key players without overpaying or overpromising. A well-crafted onboarding program can be your best counteroffensive against troublesome merger dynamics. Not everyone should have an equal say. Assess personnel to ensure proper casting in the new merged organization. Do "Stay Bonuses" Really Work? You could be buying behavior you don’t want. How Much Resistance to Change is Normal? In mergers & acquisitions, romancing the resisters holds little promise. 10-page document that covers interview preparation, the interview process, and candidate evaluation in M&A. Success is the magic potion that cures so many of the “soft” organizational ailments that accompany M&A. Results from Assessment of SVP (name of executive and details have been changed). Results from Assessment of COO (name of executive and details have been changed). Every employee looks at a merger from the standpoint of how he or she personally will be affected. Why Not Evaluate the Acquired Company's Management on Corporate Profits? Qualitative data may be more important than the numbers. Job search tips to help separated employees get their careers back on track. Notification warrants careful planning and handling. A well-defined process is needed for making crucial personnel decisions. A passive wait-and-see attitude does not work well. Seven-step process that puts strategy first. Help laid-off employees re-launch their careers. Expect to lose some folks. Determine the total potential costs from merger bailouts. Reasons to avoid re-recruiting are understandable, but risky. Who Should You Try to Win Over in a Merger? What Percentage of the Workforce Can You Expect to Be Defiant? Document covers the four steps involved in preparing a retention plan and includes a plan template. The Acquirer’s Approach to Talent Selection in an Acquisition is aimed at anticipating employee initial questions and providing perspective on talent selection.